Valentine's Day, 1989: the day when everything changed for Salman Rushdie. It was the day that Ayatollah Khomeini of Iran issued a fatwa ordering Rushdie's execution because of his novel The Satanic Verses, a book that many (despite never reading the novel itself) claimed was blasphemous to Islam. That spring, violent protests against the book broke out across the world, while Rushdie went into hiding under the protection of the British Royal Police. Eventually, the protests died down, but for Rushdie, that day marked the beginning of almost a decade of living in the shadows, worrying about the safety of his loved ones, and moving from place to place when a new threat appeared. Rushdie's newly released memoir tells the story of this decade in his life. The book title Joseph Anton: A Memoir, references the pseudonym he used while living in hiding, itself a literary reference to Joseph Conrad and Anton Chekov. MARBL spent several years processing and organizing Rushdie's collection, which also made it possible for the celebrated author to tackle in-depth research for his memoir. As a researcher dedicated to preserving fact, Rushdie knows firsthand that relying upon memory alone has its dangers, making original documentation essential. While it might seem a bit odd to the average person—going to an archive library in order to research one's life—MARBL's intensive processing of the collection allowed Rushdie to access materials and details that might have otherwise been buried in his memory or hidden in the recesses of a computer hard drive. 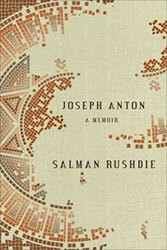 Rushdie's research process is also mirrored in the style of the memoir itself—calling his attempt to write a memoir in the first person “too narcissistic” he eventually decided to use the third-person and treat Joseph Anton, his pseudonymic self, as a character. For more information on visiting MARBL to view the Salman Rushdie collection in our reading room, please go to our website or email marbl [at] emory [dot] edu.